Watch classic music concerts with Qello app for iPad and iPhone | What Hi-Fi? Here's a clever app for music lovers. 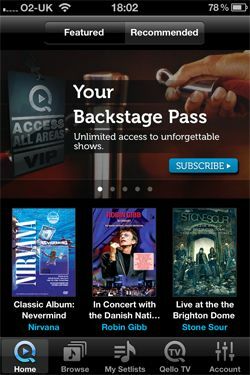 Qello lets you watch unlimited live concerts and documentaries from history on your iPad, iPhone or iPod Touch. The free iOS app lets you check out the library of content and allows you to watch one live track per artist and access "hours of free content". For your full 'Backstage Pass' you will need to pay for a monthly subscription at £2.99 a month. Artists as diverse as BB King, Cream, Dr Dre, Jay-Z, Jimi Hendrix, Nirvana, Primal Scream and many more feature on the app. As well as live concerts, Qello includes documentaries, archive footage, acoustic performances and original studio tracks. The app allows you to browse by decade, from the 1950s to the '00s, genre, artist or simply search by key word. Qello also works with AirPlay allowing you to wirelessly send the music and video content from your device to your TV using an Apple TV box or Airport Express. A 'Recommended' feature will scan your devices music library and recommend content based on your favourite tunes and artists, while 'Setlists' lets you arrange your own live concert by picking individual tracks from any of the shows. Qello is out now on the iTunes Store and works on iPad, iPhone and iPod Touch devices with iOS 4.3 or later.